This blog post is written based on source code of Elasticsearch 5.5.0 and Lucene 6.6. If you are managing Elasticsearch cluster it is very important to understand what are the segments in the index, why and when they are getting merged, and what is the right configuration. If your Elasticsearch cluster is fairly big, default configuration might not work for you. Not sure why the documentation for the Merge Policy is gone from Index Modules, but you can find it in source code (MergePolicyConfig.java). At the bottom you can find really important note about the max_merged_segment, which is set to 5gb by default. Note, this can mean that for large shards that holds many gigabytes of data, the default of max_merged_segment (5gb) can cause for many segments to be in an index, and causing searches to be slower. So what is the many gigabytes of data? Let’s try to answer on this question. First I would highly recommend you to look on Visualizing Lucene’s segment merges by Michael McCandless. If you are not familiar with Lucene you should also look into Elasticsearch from the Bottom Up. The third video in first link presents TieredMergePolicy. It is the merge policy you should be most interested in. All the other policies were deprecated in Elasticsearch 1.6 and removed in Elasticsearch version 2.0. In the article mentioned above you will find very good explanation on how TieredMergePolicy works. What helped me more, when I looked in the source code of Lucene implementation of method TieredMergePolicy.findMerges. That and looking on default configuration of Elasticsearch helped me to understand what to expect. TieredMergePolicy first computes the allowed “budget” of how many segments should be in the index, by counting how many steps the “perfect logarithmic staircase” would require given total index size, minimum segment size (floored), mergeAtOnce, and a new configuration maxSegmentsPerTier that lets you set the allowed width (number of segments) of each stair in the staircase. This is nice because it decouples how many segments to merge at a time from how wide the staircase can be. First we get a collection segments infosSorted, sorted in descending order by size. Now we have two variables, totIndexBytes is the size of all indices and minSegmentBytes is the minimum segment size. Seem like this loop can be easily combined with previous one. PR#219. Changes to the floor_segment or index refresh can cause the value minSegmentBytes be very high, which will make allowedSegCountInt smaller and that can cause a lot of scheduled merges. Changing the value of segments_per_tier can also significantly change on how often you will see segments to be merged in index. The code above uses max_merge_at_once to reserve space for the tier (level) and uses segments_per_tier to set how many segments is allowed for this tier. (both set to 10 by default in Elasticsearch). Where eligible is the list of all segments with size less than max_merged_segment/2.0 and has not been included in any merges yet. The code under this if statement trying to find the possible combination of segments to include in merges which will bring eligible.size() under allowedSegCountInt. The algorithm is simple, it starts from the largest segment and trying to find N segments (where N < max_merge_at_once), which in merge will result segment with size less than max_merged_segment. This is a reason, why actually the perfect logarithmic staircase should not happen, because this merge policy does not look for how to merge together smallest segment, but actually trying to find how to merge the largest segments first. 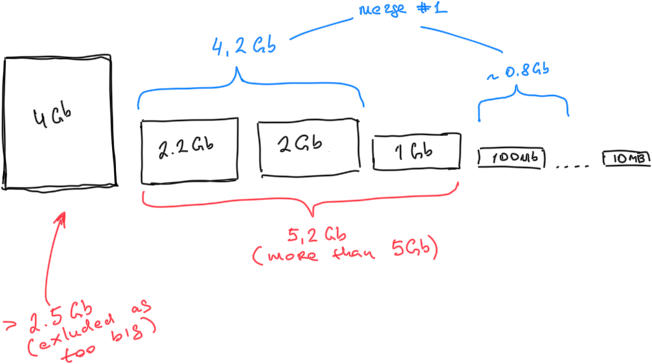 Segment with size 4.2Gb will be excluded as too big (size more than max_merged_segment/2.0). First segment considered for merge will be the one with size 2.2Gb. This segment can be merged with the segment with size of 2gb, but not with 2gb and 1gb at the same time, so it will skip 1gb segment and start looking for smaller segments which will result in size of close to 5gb or smaller (max_merged_segment), but number of segments in this merge should not be larger than max_merge_at_once (10 by default). If number of eligible segments still more than allowedSegCountInt the next merge will be constructed from segment of size 1gb and segments which are not included in previous merge (again considering two constraints max_merged_segment and max_merge_at_once). Segments larger than max_merged_segment/2.0 will not be included in any merge, even if the percentage of deleted documents is over expunge_deletes_allowed (10% by default). If you will end up with a lot of segments with size more than max_merged_segment/2.0 and you constantly deleting documents from them - their space will never be reclaimed. You will need to perform force merge or change the configuration. To previous point. If index has segment with size lower than max_merged_segment/2.0, which cannot be merged with any other segments (I would assume very uncommon situation) but has more than expunge_deletes_allowed of deleted objects - this is the time when the deleted documents can be expunged if none of other merges will be find. If you have a segment with the size of max_merged_segment/2.0 - 1byte it will never be merged with any segment and never be excluded from the allowedSegCountInt. I would assume that this is a very rarely case. I have asked to be sure that this is a known issue. Now I know why regular reindexing of all data can help with making searches faster. With TieredMergePolicy it is very likely that segments will be merged not in sequence order (see my example above). This can be a problem if terms change with the time. Because of that segments need to store terms from various periods. In my example above if 4Gb and 2.2Gb are the segments with only January data, it is very likely that these segments will be merged with some small segment at the end, for example last segment of size 10mb, which holds December data. Because of the point from above - if you have time series data - using indices with time postfixes (YYYY-mm-DD) should be beneficial. If you are planning to play with the configuration for merge policy I would highly recommend you to change this to higher value than default, that will help you to avoid index throttling. What else can cause index throttling? It really depends. First, very obvious is enabled throttling for merges indices.store.throttle.type or very low value of indices.store.throttle.max_bytes_per_sec. Seems like in Elasticsearch 6.0 these settings will be removed, so merges will never be throttled. To find what else can cause index throttling I would recommend to look on current sizes of segments, use the algorithm from the TieredMergePolicy, predict what kind of merges will be scheduled. That should help you to answer the question. Can be that you have too many small segments or maybe too many large segments.